After scorching heat of summer, first few days of monsoon are my favourite. In those days I don't like to stand in front of the gas for long time, because in the meantime you can enjoy the rain by sitting beside the window. I think you guys have already guessed that I am talking about one pot meal - they are so easy to cook. 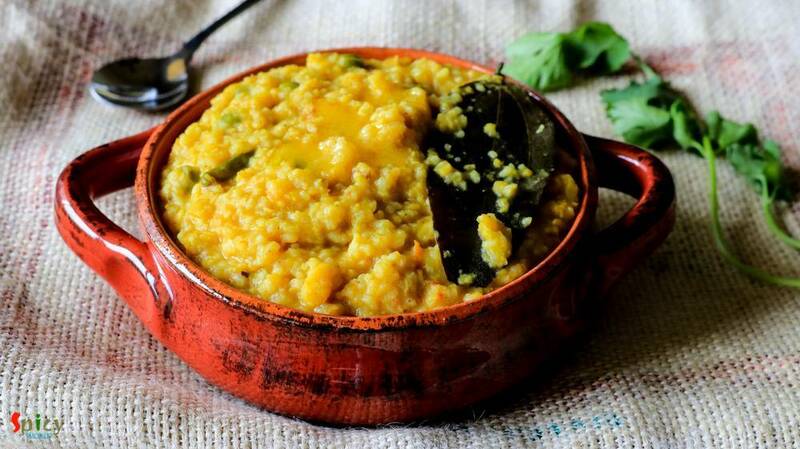 One of the famous one pot meal in Bengal is 'khichuri' / khichdi. 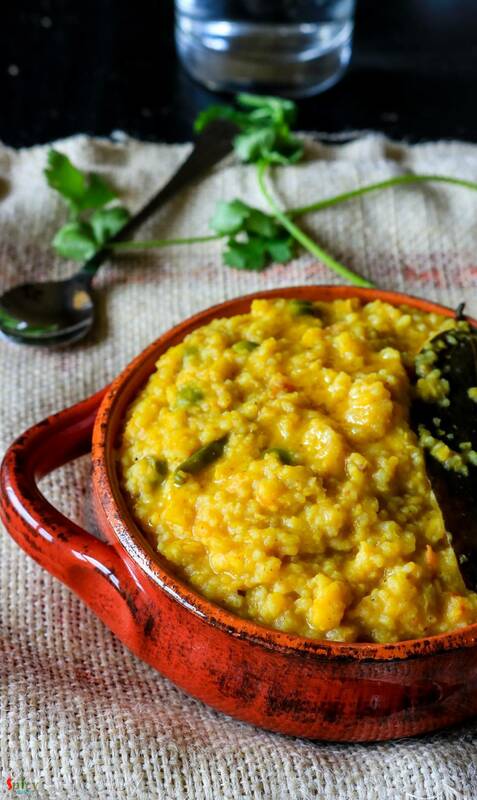 I have posted several recipes on khichdi but 'bhoger khichuri' is the basic one. 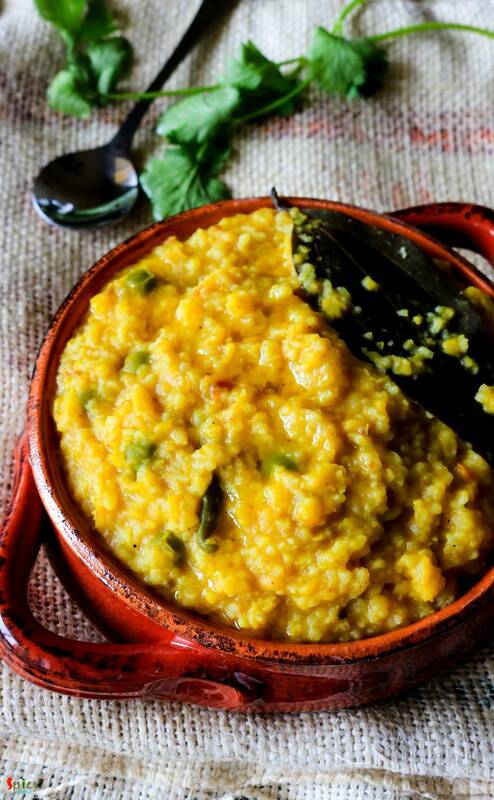 You can make this simple khichdi on 'puja' / vrat days as they are onion and garlic free. Don't expect this dish to be very rich or spicy, but to be very ordinary with full of taste. 1/4th cup of gobindovog / kalijeera rice. 1/2 cup and 2 Tablespoons of yellow moong daal. Pinch of asafoetida / hing. Spice powder (1 Teaspoon of turmeric powder, half Teaspoon of red chilli powder, 1 Teaspoon of roasted cumin and coriander powder). 2 Tablespoons of mustard oil. A Teaspoon of garam masala powder. Wash the rice and lentils with water very well and then soak them in water for an hour. Add bay leaf, cumin seeds, dry red chilli, asafoetida and ginger paste. Saute for few seconds. Then add all of the spice powder. Mix for a minute. Add the chopped tomato and pinch of salt. Cook for 5 minutes. When the oil starts separating, add the soaked rice and lentils. Mix well. You can also add some lightly fried vegetables at this stage, if you like. Then add 2 cups of water, more salt, green chilies and green peas. Mix well, bring the heat to high and let the water come to a boil. Then cover the pan, bring the heat to low and cook for 20 - 30 minutes. The texture of this dish will be mushy, so, if you need more water feel free to add. Lastly add garam masala powder, a big pinch of sugar and a Teaspoon of ghee. Mix well and turn off the heat.